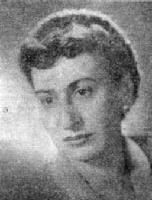 The mezzo-soprano, Tanya Tzokova, was born 3 April 1911 in Sofia into a lawyer's family. As a child she studied piano and in 1934 graduated from the Conservatorio Santa Cecilia in Rome after studying opera singing, staging and piano. In 1935 she continued working on repertoire with many famous conductors including Serafin and Ricci. Her debut was singing Laura in La Gioconda on November 30, 1934 with the Sofia Opera. In 1935 she returned to Rome and was well known for her performances in the Mozart and Verdi Requiems. She was also active in Rome performing many recitals and concerts. After returning to Bulgaria in 1936 she become one of the leading soloists of the Sofia Opera in the mezzo-soprano roles. Her repertoire consisted of 25 roles that she performed there until 1961. International appearances took Tzokova to Austria in 1938, France in 1946, Roumania in 1950, Germany in 1954 and Czechoslovakia during 1953 and 1958. Major roles in her career included Amneris, Azucena and Herodiade. She was famous for her interpretations in operas by Bulgarian composers. In addition to the opera stage she was equally known as a concert singer.